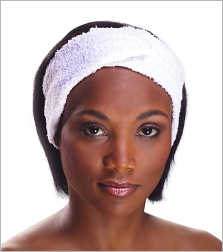 This headband is perfect for keeping hair out of your face when you are applying make-up or cleansing. Ideal for facial treatments. An ample band made of 100% plush cotton terry with an adjustable tapered Velcro closure for a perfect fit every time. White. 3.5" W x 27.75" L. Machine Washable. Sold individually.